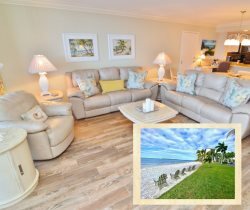 Experience a bird's eye view of paradise from the 10th floor overlooking the waterways and barrier islands towards Sanibel. Watch sunsets every night on your furnished, screened-in balcony with no shortage of photo opportunities of breathtaking scenery and purple skies. This unit offers beautiful upgrades featuring tiled floors throughout, updated kitchen with stainless steel appliances and updated bathrooms. Sleep up to 6 people with the master bedroom offering a king size bed, guest bedroom offering a queen size bed and a sofa sleeper in the living room. I had a question about the keys the first day we arrived. I sent an email and they responded right away! The view from the condo was amazing! We loved sitting on the patio watching the boats, dolphins and the beautiful sunsets! Everything was so clean and we were all very comfortable.